Thomastown Creative Arts Festival 9-19th August kicks off on Thursday 9th of August with a great programme including exhibitions by 30 artists throughout the town and surrounds. The Festival will also be featuring the Art of Upcycling Installations which have been created by community groups and individual artists. The Festival maps are available in most outlets in town. Thank you to the Kilkenny County Council Arts Office and Kilkenny County Council Waste Prevention Programme for their support with these projects. TCN has been nominated by the Kilkenny Council for the IPB National Pride of Place Awards for the Town Category (2,000-5,000 people). The judging will take place on Monday 13th from 10-12.30pm and will start and finish off at the Thomastown Community Centre with a walk through the town highlighting the achievements of the town. 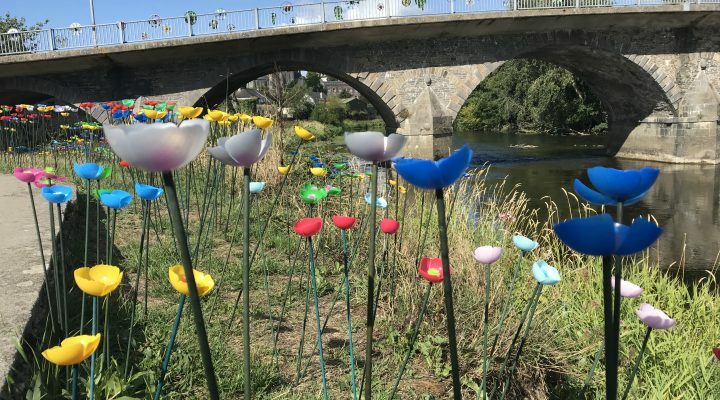 Come and celebrate National Heritage Week on Sunday 26 August, 11-1pm with ‘Stories of the River Nore’ – meet at the Ollie Walsh Statue, Mill Street, for a guided walk of Industrial and Natural Heritage along the River Nore, with stories of Grennan Mill and the Railway Viaduct and a visit to the site of the now endangered Meadow Saffron. Thomastown’s Resusable cup has been launched! A Japanese wood block print by local artist Debra Bowden was chosen for the first round of limited edition. The cups are available for purchase from Thomastown cafes participating in the Conscious Cup Campaign The promotional cost of the cups is €5 to help encourage café frequenters to get into the habit of bringing their own REUSABLE cup for take-away teas and coffees instead of using disposable cups. Thanks to Kilkenny County Council Waste Prevention Programme for their support of the programme. Save the Date : TCN is turning 2 years old and it’s Open General Meeting will take place on Wednesday 26th of September at the Thomastown Community Centre at 7pm. The current Management Group will step down and a new Group will be voted in. New members are invited to join the Network to take it forward into its 3rd year and contribute to the betterment of Thomastown.